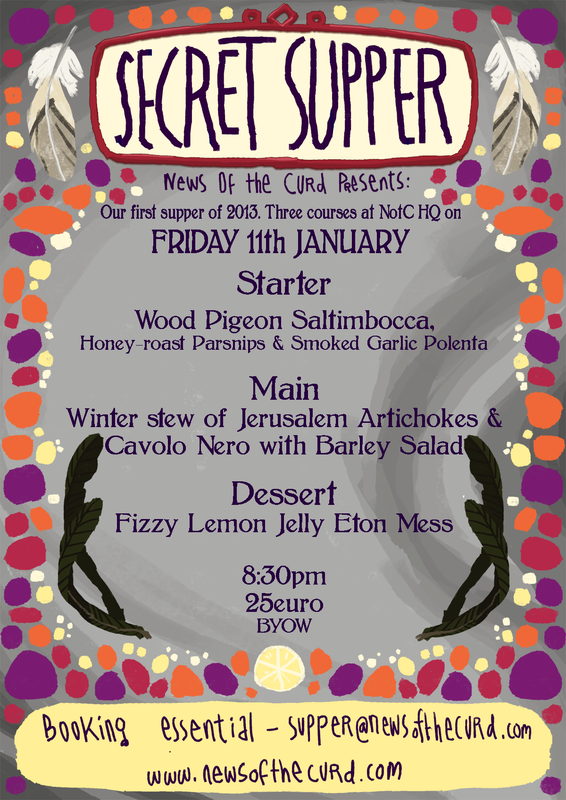 We're back with our first supper of the year! We have room for 8 more people! There's also am secret veggie option for the starter if you let me know beforehand! I'm really glad to be back at it! Finally a reason to clean the house! :D Also may I just say look at this poster...I love it. I'm a big fan of the lemon, way to go Robin! It's the usual deal, BYOW, arrive between 8:30 and 9. We'll be serving just after 9 so don't be late! I look forward to seeing you! This supper is a little inspired by a few of my favourite recent cookbooks with a little twist. The winter stew is from the magnificent ArdBia Cookbook, we felt we had to make our version after we came across IRISH Jerusalem artichokes at the market on Saturday along with The McNally's wonderful Cavolo Nero. It will all be tasty and what not!